Semi-desert, foothills, montane, subalpine. Meadows, woodlands, shrublands. Summer, fall. Prairie Dog Knoll Trail, Abajo Mountains, Utah, June 25, 2004. Is there a more common plant in the Four Corners area? 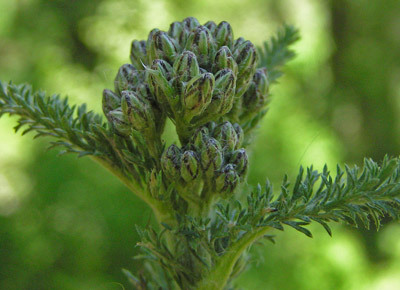 Yarrow’s fern-like leaves, which have a strong, pleasant, distinctive smell, often carpet meadows and woods. 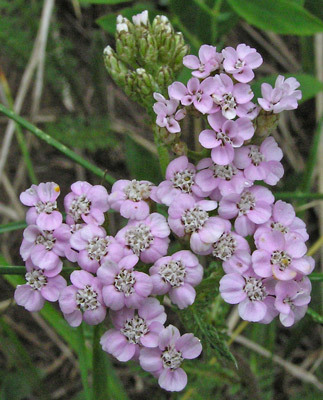 Of these masses of leaves, few produce plants that flower, but because Yarrow is so prolific there are still many flowers. 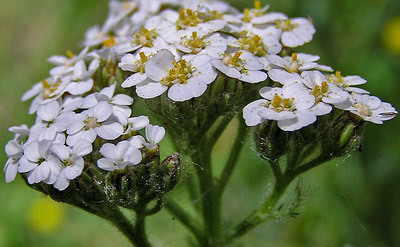 A close look at the flower often surprises, for it shows Yarrow to be a Sunflower with both ray and disk flowers. (See below.) The dried flowers are long-lasting and are often gathered for household displays. 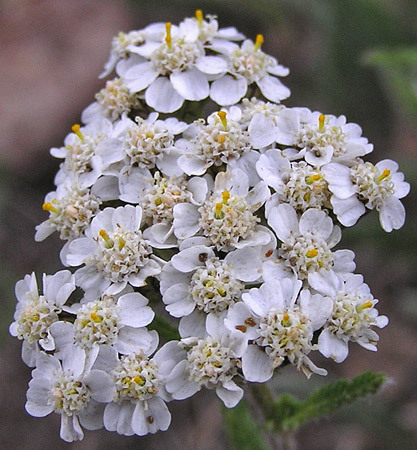 The Achillea genus was named by Linnaeus in 1753 when he also named this species "Achillea millefolium" from specimens collected in Europe. 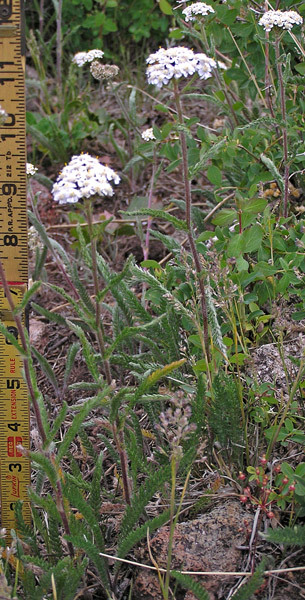 Thomas Nuttall named this species "Achillea lanulosa" in 1834 from specimens collected by Meriwether Lewis in Idaho in about 1806. Weber states that A. lanulosa and A. millefolium are "very closely related" but different species. Most other botanists, including John Kartesz, ultimate authority for plant names on this web site, treat the two as one species under the name of A. millefolium with A. lanulosa as a synonym. Achilles is believed to have discovered the medicinal uses of this plant for healing wounds. "Millefolium" means "thousand leaves". "Lanulosa" is Latin for "woolly". Lower Calico Trail, June 16, 2004. In this and the next photograph you can see a number of groupings of flowers; each grouping contains numerous, small, crowded central disk flowers surrounded by a number of large white petals, the ray flowers. El Diente Trail, July 22, 2004. Light magenta/pink flowers are uncommon. Rio Lado Trail, June 19, 2009. Beauty can be found in bud as well as in flower. 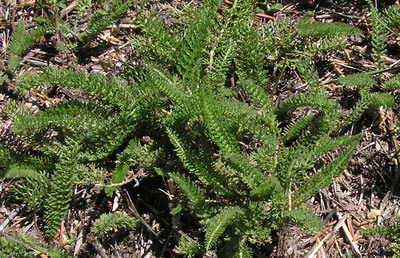 Yarrow spreads from stout roots; large patches of the fern-like basal leaves are a very common sight in meadows, woodlands, and around mountain homes.